Laws that recognise the humanity of the unborn help to save lives in at least two very obvious ways. Firstly, they act as a reminder that we are actually dealing with a hidden human being every time a pregnant woman is being spoken about. So doctors treating pregnant women are looking after two patients and they have a duty of care to do all they can to protect the life and welfare of both. If the woman in question falls ill while she is pregnant, her doctor will give her whatever treatment he needs while at the same time doing all he can to keep her baby alive also. If the baby dies as an unwanted side effect of that treatment, then this is a tragedy for all concerned and the doctor has lost one of his patients. There is a real ethical distinction between necessary medical treatments of interventionsl in pregnancy where the baby may be exposed to some risks and induced abortion, where the life of the baby is directly and intentionally targeted. Another way of putting it is to say that abortion is the only medical procedure where if the human life (baby) survives, it is not celebrated but deemed to be a failure. The other main way that pro-life laws save lives is to help create a culture where every effort is made to assist mothers and families who are facing unplanned or difficult pregnancies, encouraging them to continue with their pregnancy. In countries where abortion is not freely available or where women have to travel for abortion, they have more time to find the help and support they need and continue with their pregnancy. This was certainly the case for Mary Kenny who courageously told her story as part of the recent referendum to keep the Eighth Amendment. You can read about how relieved she is to have her daughter Hollie by clicking here. The fact that abortion is not readily available is something that saves lives in other ways too. A recent study in Texas found that a 100-mile distance from an abortion clinic leads to a 10% drop in the number of abortions taking place. 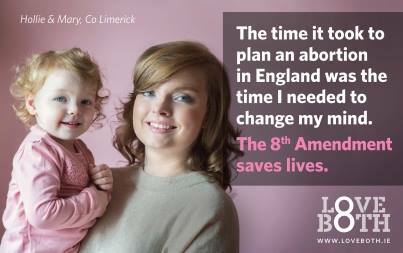 The 8th Amendment was the last remaining legal protection for unborn babies in Ireland. It was passed by referendum in 1983 by a two-thirds majority, in response to the detrimental effects of the legalisation of abortion in other countries. An independent report commissioned by the Pro Life Campaign estimated that the 8th Amendment saved 100,000 lives while it was in the Constitution. Since its removal from the Constitution by referendum on 25th May 2018, there is a greater duty than ever on pro-life campaigners to work towards the restoration of full legal protection for unborn babies and their mothers in Ireland and to reduce the number of abortions taking place by ensuring that all of our laws are family friendly in every way.